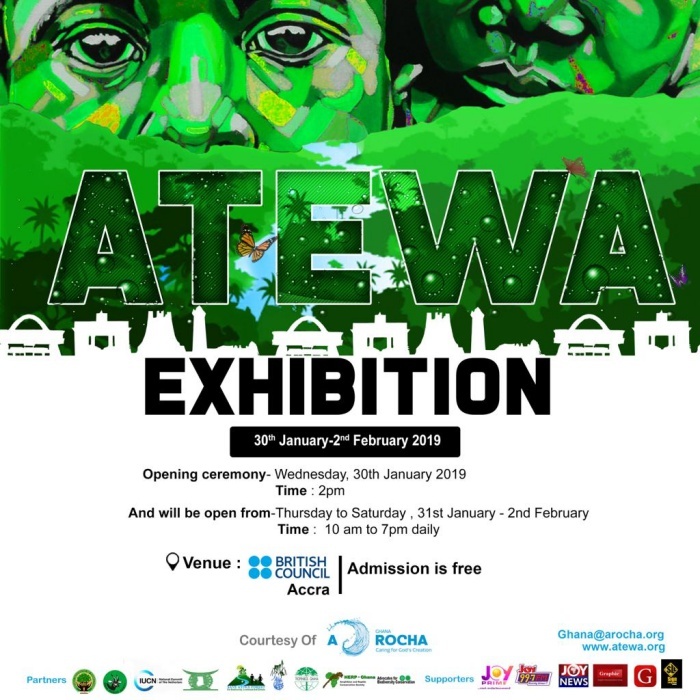 A Rocha Ghana, an environmental NGO together with partners presents and invites the general public to the first Atewa Exhibition at the British Council, Accra. The exhibition is under the theme: “Securing Atewa for Prosperity and Wellbeing beyond Today”. The menace and impact of galamsey has affirmed the urgent need to secure Ghana’s natural heritage and water sources for our wellbeing today and that of generations unborn. To achieve this, there is an urgent need for Ghana to prioritize “green landscape” development strategies and build socio-economic resilient frameworks to sustain it developmental agenda. Against this background, we need to secure Atewa forest against all odds and generate public independent actions to encourage government to reverse bauxite-mining plans and ensure the long-term sustainability of the forest landscape. The Atewa Forest, found in the Eastern Region, is the source of the Densu River, which feeds the Weija Dam and several water treatment plants. Also the source of two other important rivers; the Birim and Ayensu, which together provides water to at least 5 million people in Greater Accra, Eastern Region and the Central Region of Ghana. It is also home to over 100 identified critically endangered plant and animal species, some of which are rare and cannot be found anywhere else in the world. Exhibition will be open thereafter from Thursday, 31st January to Saturday, February 2, 2019 each day. The entire the event is free and open to the general public and will start at 10:00am prompt. Attendance for the event shall include members of the diplomatic missions here in Ghana, government agencies, schools, research agencies, civil society organizations, policy think-tanks, community members as well the general public. Tropenbos Ghana, Friends of the Earth, Herp Ghana, Ghana Institute of Foresters, Ghana Wildlife Society, Rainforest Trust, Biodiversity Advocates, Concerned Citizens of Atewa Landscape and the Netherlands Committee of the International Union for Conservation of Nature and powered by Carbon AV.